From left are Megan Schiffres, Jessica Michels-Mancini, Marilyn Bryant, Lisa Hinton-Valdrighi and Stephanie Feria. 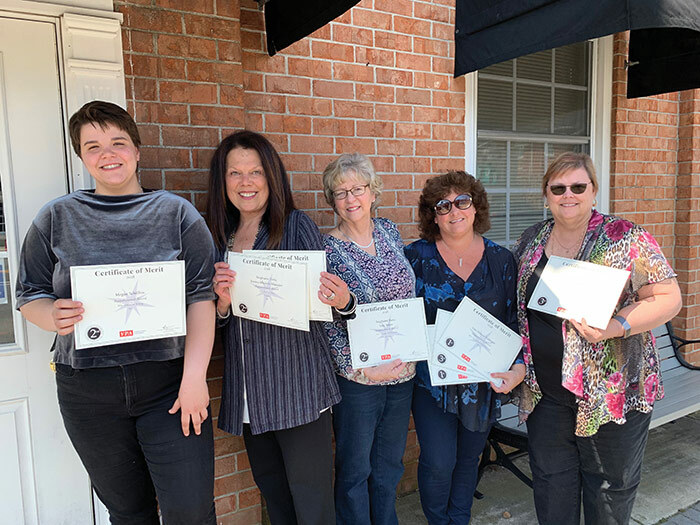 Rappahannock Record news and advertising personnel received several awards Saturday, April 6, during the annual awards banquet of the Virginia Press Association. The annual VPA conference was held at the Hilton Norfolk The Main, reported publisher Frederick a. Gaskins. Competing against similar size papers throughout the state, reporter Lisa Hinton-Valdrighi won two first-place and two third-place awards in the news contest. She won first-place honors for portfolios submitted in the business and financial writing category and in the sports writing category. Each portfolio included a selection of three newspaper articles. For the Record, Valdrighi won third in feature story writing for an article on Ta’Kayla Taylor, and for The Rivah Visitor’s Guide, she won third for a sports news photo of a croquet match. The Rivah Visitor’s Guide is jointly produced by the Record and the Southside Sentinel in Urbanna. Record reporter Megan Schiffres won a second-place award in the education writing category for a portfolio featuring her coverage of Northumberland County schools. The Sentinel won 12 awards in the 2018 contest, including third in the special sections or special editions news category for a Wings, Wheels & Keels supplement. The section also appeared in the Record. Tom Chillemi of the Sentinel created much of the content for the publication and it was designed by Susan Simmons of the Record. Record advertising and production staff members won three second-place and three third-place awards in the 2018 state contest. Ad sales rep Jessica Michels-Mancini and graphic designer Stephanie Feria won second for an ad produced for Tommy’s restaurant in Reedville and third for an ad designed for Out of the Oven Bakery in White Stone. Ad sales rep Sara Amis and Feria won second for an “Own the Summer” promotional ad for the Record, and sales rep David Cole and Feria won third in the real estate category for a Bragg & Company ad. For The Rivah Visitor’s Guide, Record ad sales rep Marilyn Bryant and Feria placed second for a Steamboat Ear Museum ad. Amiss and Feria won third for an ad produced for The James Company.